The update will allow users to translate three new languages. 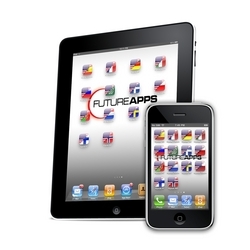 Today Future Apps, a software company that specializes in software solutions for the iPhone/iPad platform, released an update to iSpeak Translators, an app for the Apple iPhone and iPad. iSpeak's application allows a user to receive translations on a mobile device, using text-to-speech synthesis that "speaks" the translation back in the target language. This 2.0 update includes three new iSpeak apps: iSpeak Arabic, iSpeak Greek, and iSpeak Russian, which brings to 14 the total number of iSpeak language translators. Languages that are already available include English, Spanish, French, German, Italian, Portuguese, Dutch, Polish, and Swedish. In addition, iSpeak 2.0 updates will now run on the iPad and have been configured specifically for the larger screen . The company adds that there is no additional cost for this upgrade. Currently, a user pays $1.99 per language. With this update, the iOS 4.0 support will allow users to multitask, since one will be able to switch in and out of the application as needed. Also, since the text-to-speech engine plays the translations in the background, you could potentially hear the translation while you use other apps. "Our iSpeak apps have seen great success since they were released a year ago on the App Store. Our unique voice-empowered solution allows customers to do anything from learning a new language to conducting business overseas on a device that fits in their pockets," says Future App founder John Stefanopoulos in a statement. "We are happy to bring full iPad support, and the addition of Arabic, Greek, and Russian with this update."